Where is the Black African Spring? 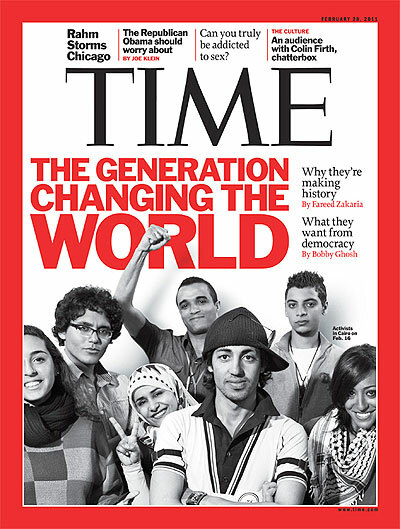 In February 2011, TIME magazine had published on its front cover, the faces of young people from different parts of the world, with the caption THE GENERATION CHANGING THE WORLD. It was the season of an avalanche of youth revolutions across the world. Youths, powered by technology had taken on age-long tyrannies and uprooted them; these youths were tired of oppression, injustice, monumental corruption and gross inequalities in the economic equilibrium of their nations. As I stared at the cover page with the faces of these young people, it hit me with a jolt that none of them looked like me – there was no black face among them all. It is a known fact that Sub Saharan Africa has some of the most disheartening statistics in government corruption and widespread underdevelopment and poverty. Plus, this system has been the order for decades upon decades, yet in the season when youths all across the globe rose up against injustice, the black youth was nowhere to be found. 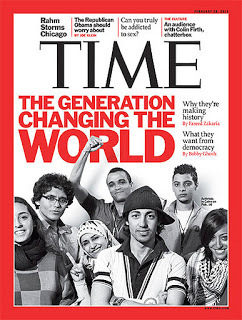 From Tunisia, to Egypt, Syria, Libya, young people demanded emancipation. But Black Africa has remained calm and silent, as though things were okay with us. The revolution rolled from the Arab world to the West: Israel, Spain, London, New York, California, Chile, yet Black Africa has remained silent, as though our living conditions were better off than those of these people who have taken to the streets to voice out their dissatisfaction with their governments. The average Egyptian lived on $3 per day, while his Nigerian counterpart barely lived on $1.5 a day, yet when Egyptians trooped to the streets against oppression, we, Nigerians merely watched, laughing and arguing about it, suffering and smiling. Former dictator of Tunisia, Ben Ali got to power the same month as current dictator of Zimbabwe, Robert Mugabe. But when Tunisians trooped out and drove out Ben Ali from power, Zimbabweans took the “siddon look” posture at Mugabe; yet, this man has totally wrecked the economy of his nation, not to mention his extreme wickedness and high-handedness. What exactly is wrong with Black Africa? Why is it so easy for us to engage in petty ethnic skirmishes, but when it is time to coagulate thoughts and actions for a worthy struggle, it just never happens? Are we really as smart as we think? Every now and then the government comes up with a fresh set of statistics that the economy is growing. But where exactly is this growth? Who are the people who benefit from the growth? How evenly distributed is this growth? Do the Nigerians who live below the economic radar, the DE socio-economic class who constitute over 60% of our population ever benefit from this so-called economic growth? Or is this growth just increase in the profits of a few already comfortable billionaires? In every nation there is a level of people who are cut off from all these economic postulations, they neither feel it nor enjoy it, like those who live on social welfare in America. In other parts where there is no welfare, they live by the day. They struggle from day to day to survive. The only thing they could ever enjoy from government is the provision of social amenities and infrastructure. Good roads to transport their wares fast and safely, good public schools to send their children to, electricity to power their homes, potable water in their homes, and security on their streets, yet these amenities are not available in Nigeria. The poor in America and certain other nations of the world enjoy these basic amenities, hence their way of life becomes not as despondent as it would have been. But in Nigeria, over 60% of our people are effectively cut off from any benefit of governance, yet we continue to grill out a living in the most pitiable of conditions, from day to day. There needs to be a change of order in Nigeria. This current system where the tail wags the dog is not acceptable, neither is it sustainable. Some day we just have to break out of the grip of our fear, take our destiny in our hands and reshape the future of our nation. Youths all over the world have shown the way. The avalanche of revolutions with started in the Arab nations this year has been termed the Arab spring of 2011. I ask, when will the Black African spring come?